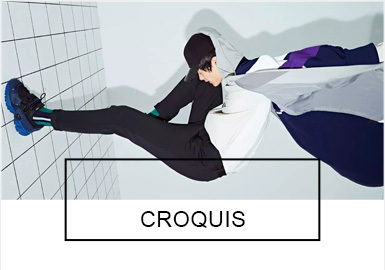 The inspiration of CROQUIS' 2019 S/S collection is from David Bowie and his Space Oddity. From the experimental perspective, designers change the traditional images of sportswear to elegant ones. Functional silhouettes are still used. The asymmetrical color-blocking splicing is still prevalent on sports brands. Highly saturated colors such as red, yellow, blue and green are youthful and dynamic. Patterns are mainly on chest and back; embroidery is delicately three-dimensional. The collaborated items between Adidas and Have a good time keep their own features; MLB integrated Chinese traditional dragon totem with American baseball culture. Luca Font, an Italian graffiti and tattoo artist, likes to make multi-dimensional space with abstract color blocks, which is rebellious and artistic. 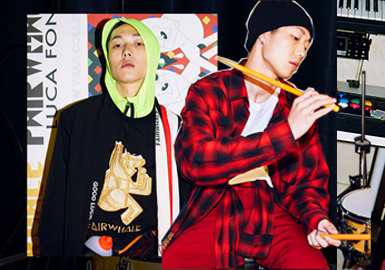 The 2019 resort collection of Fairwhale uses Hi Pig to show the liking of nature and animals. Bright colors make portraits vivid and attractive. Highly saturated color blocks are striking and youthful.